When EDF Energy sent me a new Amazon Echo Dot, I thought for quite a long time about where to put it. I considered the kitchen, to use it as a timer and to play music while I’m cooking. Or maybe the living room – I have quite a few smart home gadgets, including Philips Hue light bulbs and a smart heating system, so in the living room Alexa could’ve set the lighting for me or turned on the radiators. The thing is though, I can control those things from my phone and when I’m downstairs I normally have my phone nearby. Where could I put Alexa that she would add most value? 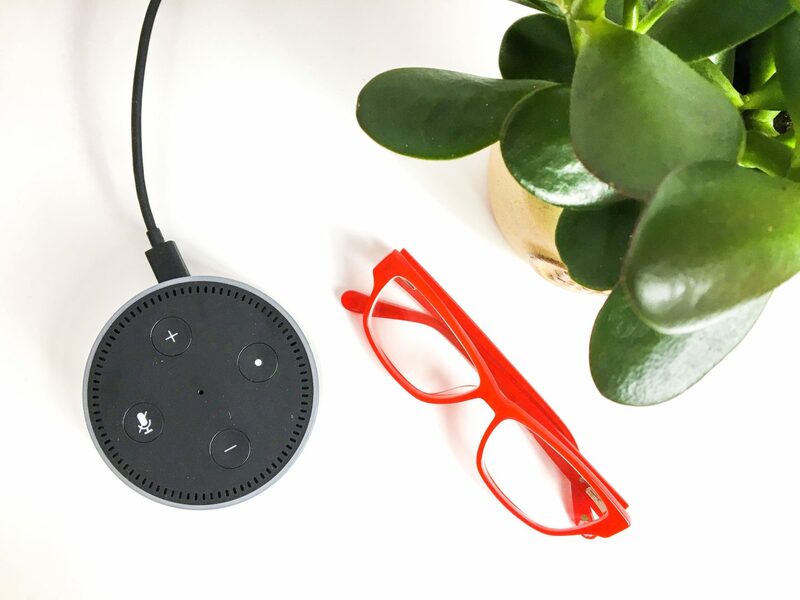 In case you’re thinking ‘I don’t even need to read the rest of this post, I just want one now’, then the Amazon Echo Dot is available to buy in the EDF Energy Smart Home Store, along with a whole load of other cool smart home products including smart lightbulbs, plugs, thermostats and radiator valves. The first thing I did once I’d got Alexa set up was to change her voice, which you do through the Amazon Alexa app under ‘languages’. The English version is fine, but I find it a tiny bit robotic and somehow not that friendly. I was torn between the Indian woman and the American. Both sounded nice – like you wouldn’t mind having lunch with them and maybe a couple of glasses of wine. Next up I had a play with some of the more basic Amazon Echo functions. Did you know for example that you can set up routines, so that with just a word or two you can trigger a whole series of actions? When I say ‘Alexa, bedtime,’ she turns the lamp on ready for me. When I’ve read for a bit and am ready to go to sleep, I say ‘Alexa, goodnight’, and she switches off the light and says something friendly. 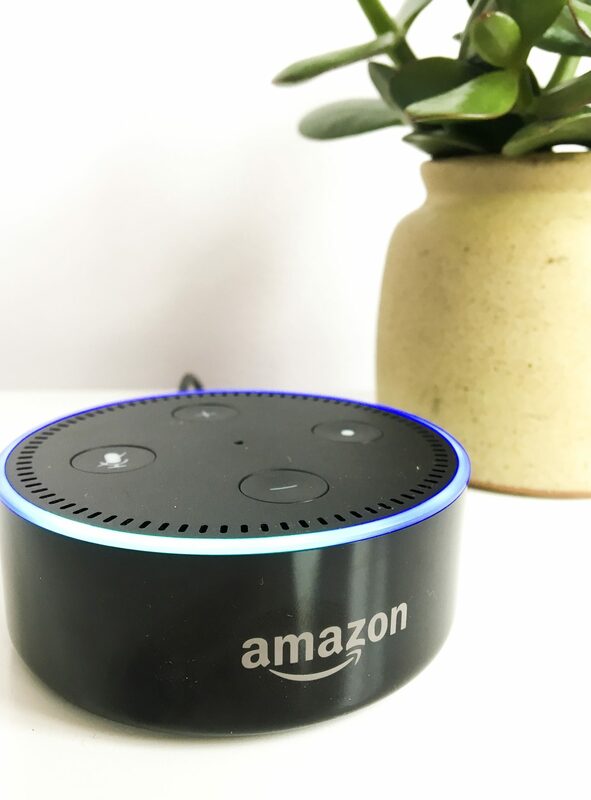 Although I knew all about the basic things I could get Alexa to do, like setting alarms, listening to audiobooks and playing songs from Spotify, I didn’t know until I started doing some research about Alexa Skills. You can see the whole range of Alexa Skills at Amazon, but basically they’re fun ‘extras’ that you enable on your device and allow you to do additional things like guided workouts or hear your horoscope. If you want to give your kids a bit more maths practice, or are just really square like me, then you might like a test from the maths coach. To relax afterwards, maybe a spot of destressing with the Headspace meditation skill? Or see how you compare to the rest of the world by playing Would You Rather. If you loved doing choose your own adventure stories when you were younger, (me), then look out for Earplay and Codename Cygnus – voice activated stories where you get to choose what happens next. If you have more than one Amazon Echo in the house you can even use them like intercoms. If you’re dishing up dinner for instance, you can ask Alexa to let everyone else know that it’s time to come and eat. I think my favuorite though, which I haven’t been able to use yet, is the Alexa advent calendar. I am VERY exciting about getting a festive jingle or fun fact every day in the run up to Christmas. 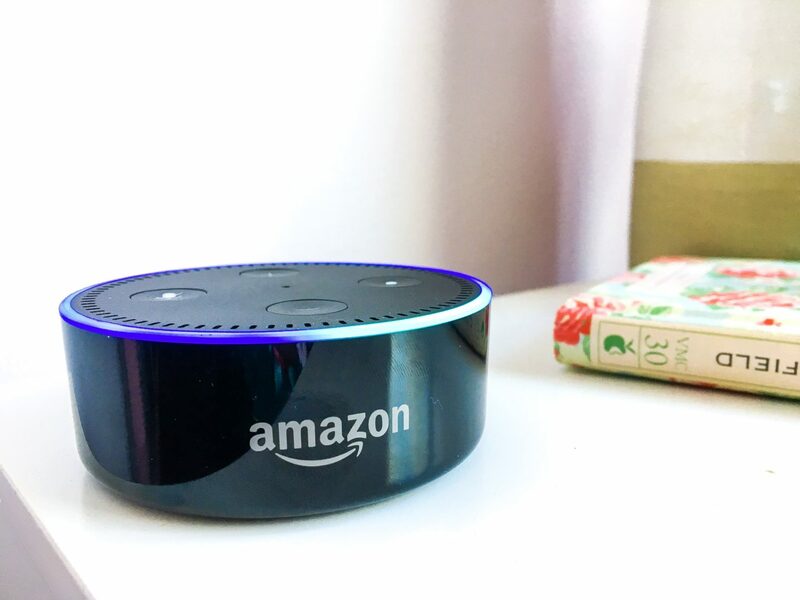 If you’ve been reading this thinking ‘damn, if only I had a robot butler friend who would play me music and get me excited about Christmas!’ then read on, as one lucky reader is going to win an Amazon Echo Dot of their very own. To enter, do as many of the entry options in the widget below as you can – the more you do, the better your chances of winning your own Amazon Echo Dot. The competition will close at 11.59pm on 8th October and is open to UK residents only. Full T&Cs apply. Don’t forget to check out the EDF Energy Smart Home Store too for all your smart home gadgety needs. Fingers crossed. Baby due next month so this would be great to go hands free! !